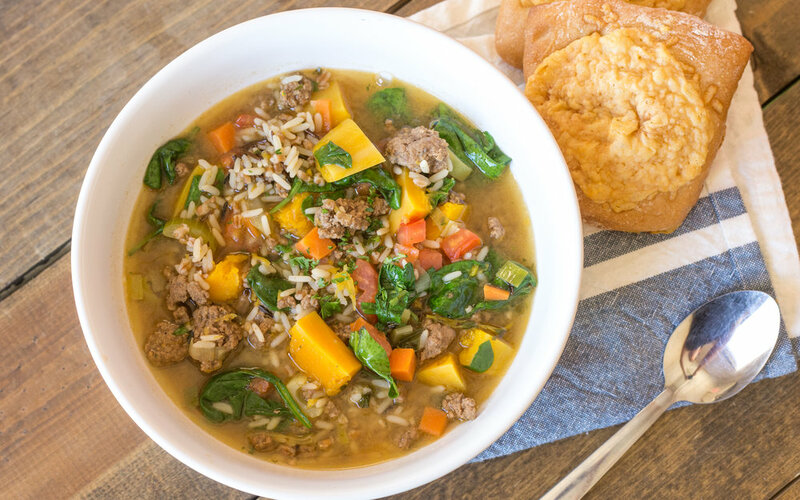 Beef Harvest Soup w/ Local Asiago Rolls — Happy Food Co. EMPTY the contents of olive oil packets in a medium stockpot over medium-high heat. ADD the beef, leek, carrots and celery. SAUTÉ until beef is browned and cooked through, about 5-7 minutes. MIX organic beef broth concentrate packets with 4 cups of hot water in a liquid measuring cup. Stir until dissolved. ADD the butternut squash, thyme, parsley and garlic to stockpot. Stir to combine. STIR in beef broth and midwest rice medley to stockpot. Stir to combine. SIMMER for about 10 minutes on medium-low heat. 3. STIR IN THE REMAINING INGREDIENTS & ENJOY! ADD the spinach and tomato. Stir well. SIMMER another 10 minutes over medium heat. FINISH soup with a lemon juice and season to taste with salt and pepper. WARM asiago rolls in microwave to soften and dip in the soup for a wonderful side. This wine features concentrated flavors including wild berries, plum, licorice and mocha. The full-bodied and mouth-coating texture on the palate leads to a long and graceful finish.